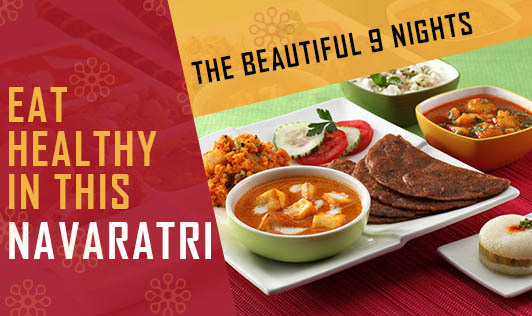 With the start of navaratri fasting and feasting season is back again, although most of us agree that this is the right time to lose weight but somehow healthy eating takes a backseat for most people. Instead of fasting, most of us end up feasting on high-calorie food in these nine days. No, I am not asking you to forgo all your favorite food and just start to eat only salads but with a slight modification in traditional recipe and some menu substitution, you can avoid a lot of calories. 1.For those who fast all nine days, it is important to eat small meals at regular intervals. This will keep your metabolism in top shape. 2.Avoid fried foods and include more of low-fat yogurt, smoothies, lassi and fruits which not only will keep you full but maintain the optimum fluids in the body. 3.Instead of puri or pakodas (both fried) made from Kuttu atta (buck wheat), try out Kuttu ki roti, replace fried aloo-chat with boiled aloo-chat and kheer with mixed-fruit curd or flavored yogurt. 4.If you are a foodie and want to please your palate, make some idly and dosa from the samak rice (a variety of rice) instead of only kheer. 5.Limit your potato intake by taking small portions of it every day. You can also consume tapioca and sweet potato. 6.Dishes which require the whole milk can be cooked with skimmed milk or double toned milk. 7.Substitute sugar in sweet dish with a low calorie sweeteners or brown sugar or jaggery. 8.Make sure you drink enough of liquids such as plain water, coconut water, lemonade (without sugar), herbal teas etc throughout the day which can keep u hydrated. 9.Eat vegetables like pumpkin and bottol guard in different form like soups and curries to fill you up with fewer calories. 10.Use rajgira flour (Amaranth flour) to make chapattis instead of using kuttu ka atta. It's lighter and lower in calories. 11.Look out for innovative navaratri recipes such as kadhi, thalipeeth and cheelas. These can be made with very minimal oil and are delicious to eat too. 12.Make friends with fruits this navaratri. Try including fresh fruits in your diet in various forms of salads, low fat smoothies and raitas to keep up with your nutrition. You can add honey on the fruits while consuming for increasing the taste and control the sweet craving. 13.Instead of having namkeens and pakodas as snacks, have a handful of nuts like almonds, pistachios, walnuts or hazelnuts, roasted peanuts, sunflower seeds, pumpkin seeds. 14.Drinking low fat milk, lassi and yogurt could reduce your cravings to eat junk food .Add cucumber, tomato to your yogurt to make it more filling. Craving for sweets could be reduced by consuming sugar added to curds. 15.Keep your guilt trips to minimum by practicing portion control. Choose healthy food and keep your portions under control. This Navaratri, try out a low-calorie diet that also pleases your taste buds. So eat sensibly and don't let your fasting ruin your diet...Happy Navaratri.